Update: you can now download these as a PDF here. In my day to day, I get asked questions such as “But what specifically will you do to grow my audience?”, “What specifically did you do to get those results?”, or “How long should I expect SEO to take before it works?” often. If I had a dollar for each time I was asked, I’d already own that SUV I have my eye on. Through this post you will see multiple examples of what different search marketers and agencies have done to grow their clients. Your takeaway should be that there are many ways to grow a website, and there is no one-size-fits-all strategy. Every business and site are different, and depending on history of SEO work the strategies and tactics needed to be done will vary. This post should serve as a set of signposts and give you ideas for what the different paths to take could be. If you need help figuring out where to start, maybe engage someone on Credo for a technical SEO site audit. So we reached out to a few of the SEOs behind these tweets to get some more insight into what they did specifically to get these results. 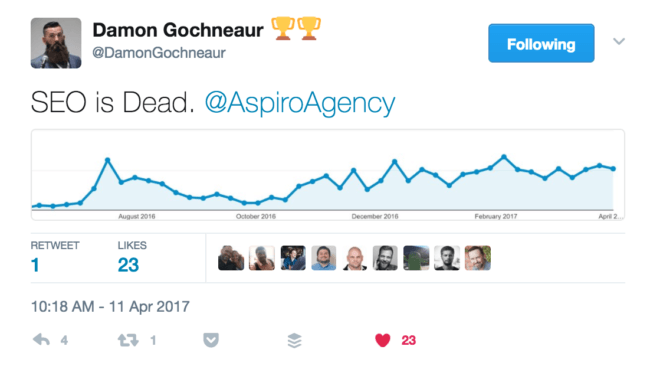 Damon and his team at Aspiro Agency are unabashed generalists, but they do fantastic work across the spectrum of SEO, paid social, and paid search. Most importantly, no new content or link building. Barry Adams is the founder of Polemic Digital, a small agency in Belfast, Northern Ireland. Client 1 is a local business, and they were with another agency for a long period of time. That agency got the client to a certain level but then they plateau-ed. That sort of thing happens all the time, no harm in that. What was needed was a fresh perspective and some new ideas, which I brought to the table. What we did for client 1 was pretty simple: we split out some pages in to multiple ones to allow for more targeted keyword focus. The site had several pages that targeted an array of similar keywords, but I felt they were dissimilar enough to warrant separate pages of their own. When we launched those new pages, we immediately saw some gains in rankings, and traffic appeared instantly to those pages. This has been amplified by further on-page improvements and some linkbuilding. Client 2 is a slightly bigger business targeting the whole of the UK and this was a different project entirely. This client has in-house resources but they didn’t know what to do and how to do it. So it started with me developing an SEO strategy for them, with some knowledge transfer and training as part of the delivery of the strategy. From then on the client did all the hard work, I was just involved on an ad-hoc basis to sanity-check what they were doing and provide guidance for their new website, as well as vet any new SEO ideas they came up with. Progress has been steady and especially in the last few months they’ve really seen strong gains in what is a very competitive industry. Ian Howells is a North Carolina based marketer, currently the Director of Marketing at Lending Tree. Focused link building. It still works. This is an ecommerce site that had dealt with some penalty issues in the past. They worked with an agency and managed to clean up a lot of content issues and get past the apparent impact of previous Panda updates, but were essentially flat-lined at ~5k visits a month (from organic search) after that. 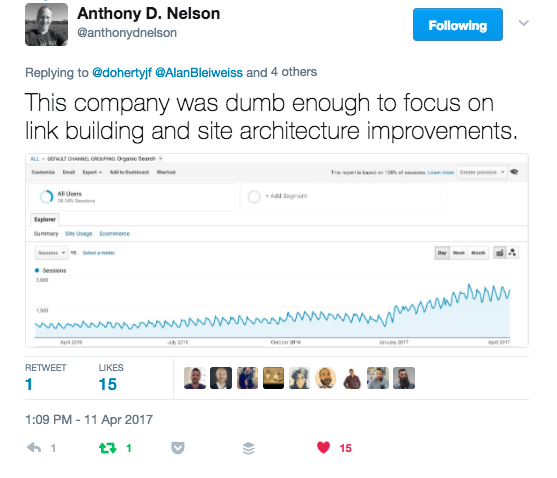 Their on-site SEO was in good shape, they had pretty solid content, but they had no active link building strategy. We started working together in September of 2016, averaging 10-15 new LRDs a month. We focused on building links to the home page, using variations of the company name, domain, and founder’s name. The primary tactics were fielding HARO requests, and offering quotes to bloggers. The industry for the store is “boring” – but the story of the company and its journey as a small business is interesting. That became the hook. Most of the outreach was to small business/entrepreneur blogs, offering to give an interview or a quote on a handful of topics the owner had a lot of experience in. These aren’t niche-relevant in the traditional sense, but were solid mid-tier sites (DA in the mid 30’s to put an easy metric on it). Since we were giving quotes, everyone consistently used anchors like ‘according to %name%’ or ‘%name%, founder of %company%’ which was perfect since they were too heavy on keyword anchors when we started. About 80 LRDs later, the site is pulling just north of 10k visits from organic. Same content, same site structure/tech setup – just more links and an anchor text portfolio that makes sense. Alan Bleiweiss is a California-based SEO consultant who specialized in what he calls “forensic SEO audits”, where he goes back in time (at least Internet time) to identify issues holding back your website from ranking. While traffic was rising slowly (this screenshot is over the past 12 months), they began investing in link building and improving Google’s crawl on their site by creating a better organized website. Traffic has essentially doubled. This client experienced nice growth primarily due to attacking two projects aggressively. Link Building Campaign: This client had a relatively modest existing external backlink profile and was a fairly large site. This lead to the site having trouble being crawled with the frequency and depth we’d like to see. For backlink acquisition, we primarily focused on partnerships (including getting a couple of sites with near site-wide links back to us), competitor backlinks and .edu resource pages (not Scholarships). Architecture Expansion & Cleanup: This client had a fairly large site already but there was a lot of opportunity on the table due to the way they were handling facets and refinements via stacking parameters. We updated how we handled this to focus on creating clean permalinks and as a result created a ton of pages that were perfectly optimized to capture their long tail keyword variations. As for cleanup, there were some inconsistencies with how they were handling canonical tags as well as breadcrumbs so fixing these two issues allowed us to fix internal duplicate content and send clearer singles and link equity through our site to the desired pages. Aleyda is a Madrid-based SEO consultant and world-renowned speaker. She’s also a cofounder of Remoters.net, a Moz Associate, and all around a great person. Her specialty is international SEO, where she helps her clients either take their company international or fixes their international SEO issues so that they can grow their business worldwide. A client came to me to have SEO support and validation to make sure that their upcoming Web platform update was not going to negatively affect their organic search results. 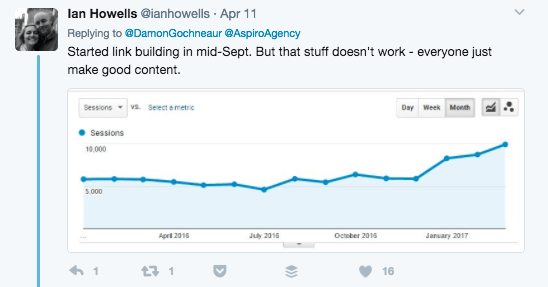 When doing the initial SEO audit what I found is that they were already losing organic search visibility and traffic from the previous year due to already implemented changes that hadn’t been taking SEO into consideration. I also identified additional opportunities to improve their crawling, indexation, better target some of their most relevant and money-making queries for their top products with their already existing pages as well as to create new one to target even more. So I took the opportunity of the already planned Web update that required some structural changes to also implement these SEO recommendations, besides validating that the planned changes were correctly implemented taking SEO best practices into consideration. The results were going from a -29% decrease YoY to a +64% YoY in organic search. Brian T Clark from House of Search sent me two different screenshots and case studies. Both deserve to be highlighted here because they show very different ways that SEO can work, and how the strategies and tactics used change depending on the site’s history and needs. Built new structure to give site depth. Fixed dupe content issues with redirects and canonicals. Cleaned up internal links to avoid links to redirected, non-canonical, or 404 pages. Provided ongoing content recommendations for their writers. 50% increase in organic traffic. 223% increase in organic sales. 55% increase in new organic sessions. This case study does not have a traffic screenshot because Brian and the site agreed that screenshots would only be shared on his site. You can see those here. This one is especially interesting in light of this recent post about the site and how Google has moved aggressively into their niche and also seemed to be quite unethical towards the site. The site is CelebrityNetWorth.com. Over the past 6 years, I’ve done a couple of SEO and Content Audits for Brian Warner and his team. along with content recommendations to improve pages/session and reduce bounce rate. Through this the site saw a 142% increase in organic traffic for 3 months post-Panda. I have a personal consulting client that is a content company. They own the content but also syndicate it out to a lot of other very authoritative sites. When I began working with them in mid-January, their traffic was down 42% year on year. Over the last three months their organic traffic has gone up 142%. We’ve seen great growth and it’s looking like that will continue into the far future! That’s how SEO actually works. It’s complicated. Sometimes it’s doing the basics right. Sometimes it’s new content and outreach. Sometimes it’s cleaning up a lot of technical debt and fixing how your site is structured. SEO is complicated. So if you need help, go ahead and create your project here and we’ll reach out to help you put together the right project then get you introduced to the right people. Great post John. There’s so many ways of approaching it, I guess it’s what is a priority and what stage your site is at. “fixing the broken” seems to be the sensible initial approach “technical tweaks” has always delivered benefits and content/outreach/link building works if done well. This is getting a share internally at work as it certainly supports our current approach! It’s surprising what a spring clean can do to help a site start to rank again. Love this. Great use of mini case studies to prove SEO is far from dead. Great blog post on SEO case studies and the importance of SEO! 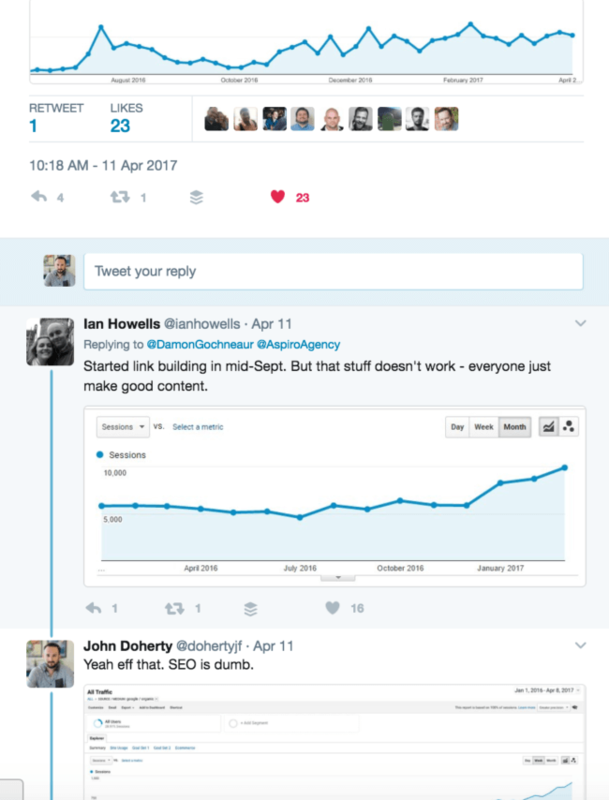 I always enjoy others showing how powerful SEO can be and bringing more transparency to the profession. I have a case study I did myself that takes a look at how consolidating sub-domains and going responsive can help you organically your audience might find interesting to look at: http://rachelmhowe.com/2016/case-study-sub-domain-consolidation-going-responsive/. It’s from the end of last year and will be working on adding updated insights. SEO will never ends. There will always be some factors that allow to manipulate search algorithm. Years ago Yandex tried to eliminate links as a ranking factor and what? Nothing. SERPs was so junky that they had to go back to links. Its simple.